A recent study of men with early-stage prostate cancer found no difference in 10-year death rates, regardless of whether their doctors actively monitored the cancers for signs of growth or eradicated the men’s cancers with surgery or radiation. What does this study mean for patients? Based on research we have conducted on prostate cancer decision-making, the implications are clear: Patients need to find physicians who will interact with them the way a good financial counselor would, taking the time to understand them well enough to help them find the treatment that fits their goals. Imagine a couple in their 40s who ask a financial counselor for advice on retirement planning, and the counselor tells them how much to invest in domestic and foreign stocks versus bonds versus real estate without asking them about their goals. A good counselor would find out what ages the couple wishes to retire at, what kind of retirement income they hope to live off of, how much risk they are willing to take to achieve their goals, and how devastated they would be if their high return investments go south, forcing them to delay retirement or reduce their retirement spending. Far too often in medical care, physicians don’t behave like good financial counselors–they give treatment recommendations without taking the time to understand their patients’ goals. Consider early-stage prostate cancer, a typically slow-growing tumor that is not fatal for the vast majority of patients who receive the diagnosis. In some men, the tumor lies indolent for decades. For that reason, men sometimes choose to monitor their cancers–have their doctors conduct regular blood tests or biopsies to see if the tumor is beginning to spread. Such monitoring has the advantage of being relatively noninvasive, but it can create anxiety for patients who wonder, every six months, whether their next checkup will bring bad news. For that reason, some men prefer active treatments like surgery or radiation that eradicate their cancers and therefore reduce cancer-related anxiety. But these more active treatments have their own downsides–each treatment is relatively arduous, and they can cause both erectile dysfunction and urinary incontinence. The choice between active treatment and active monitoring depends on a patient’s goals–on how they view the trade-off between outcomes like cancer-related anxiety and erectile dysfunction. When counseling patients with early-stage prostate cancer, physicians need to help patients focus on these trade-offs. 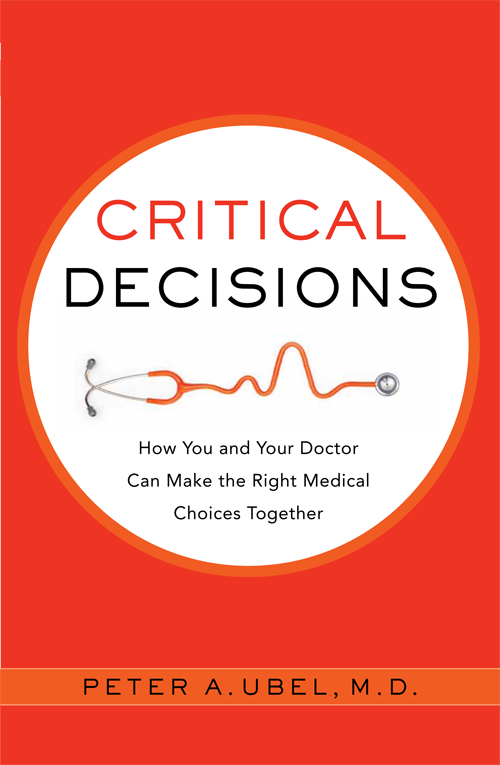 This entry was posted in Uncategorized and tagged bioethics, cancer, doctor-patient communication, medical decision making, prostate cancer, shared decision making. Bookmark the permalink.